How brilliant is Easter! Seriously, any holiday that makes it acceptable to eat chocolate for an entire day, is totally ok by me. And if you’re anything like me, you’ve probably been dragging the whole eating Easter eggs thing out for weeks (coughs.. months) now. 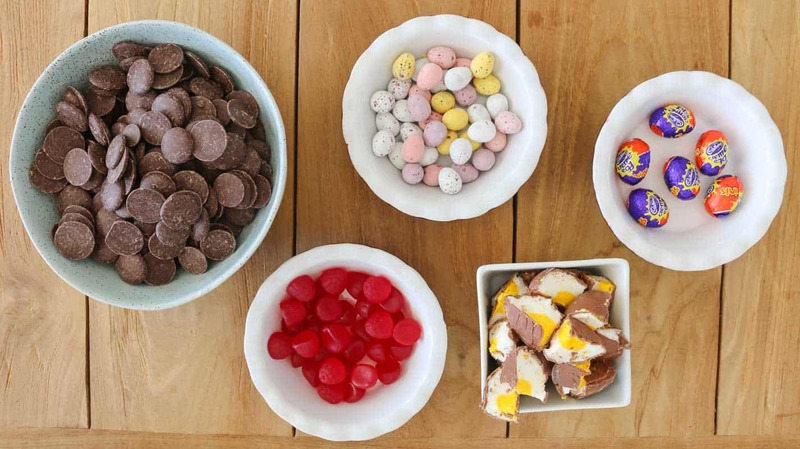 What on earth is it that makes Easter chocolate taste so good? Sorry, I’m getting sidetracked! The trick to a really good rocky road is to make sure you use plenty of melted chocolate. 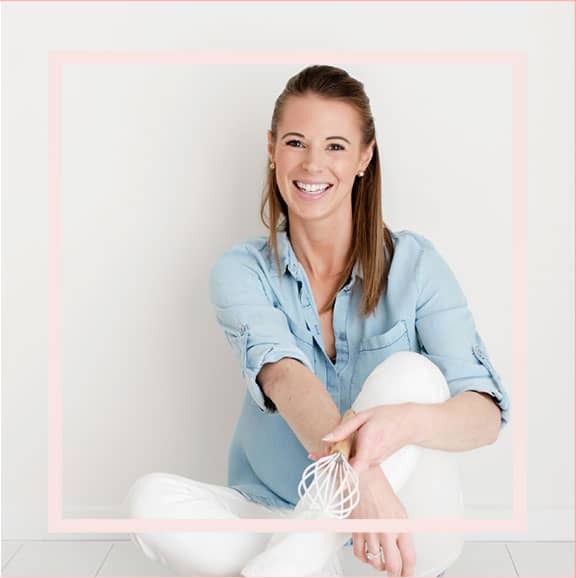 I love to pack my rocky road full of yummy add-ins, but if you don’t have the right chocolate-to-yummy-goodies ratio going on, it kinda all falls apart in one big mess! This rocky road has the perfect balance of delicious little bits and pieces and melted chocolate. OMG it’s good. Use a good quality chocolate for melting. The melted chocolate is the main ingredient, so choose a really yummy brand! Work quickly! 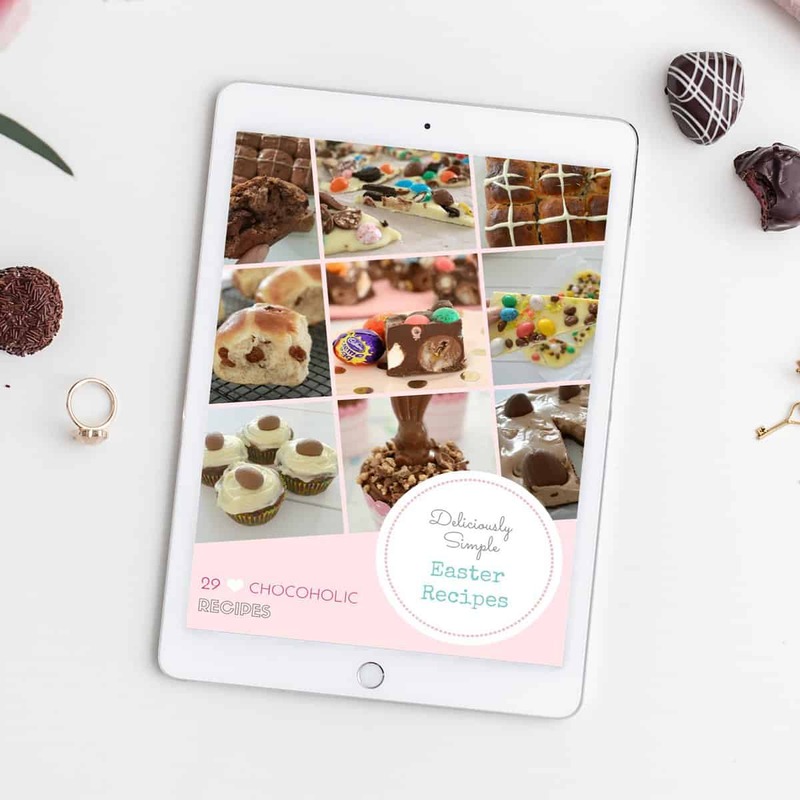 The chocolate will begin to set quickly, so make sure your baking tin is prepared before you start! 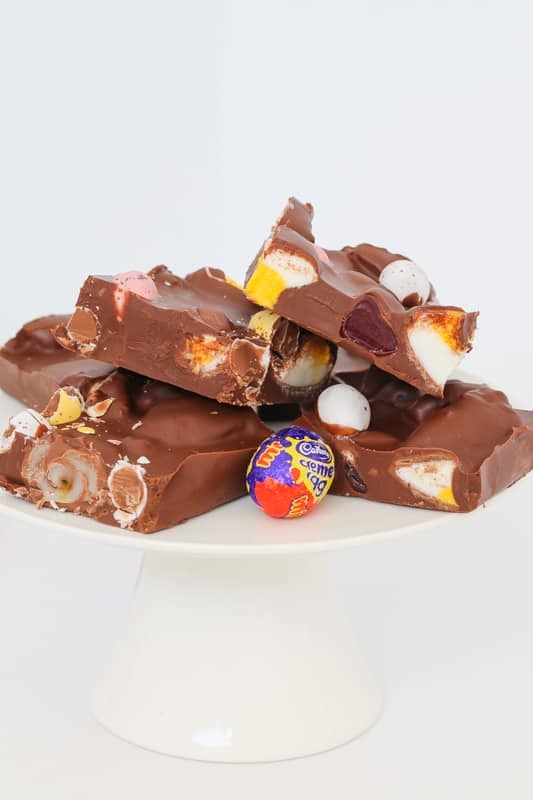 What kind of Easter eggs can I use in rocky road? Can I make some substitutions? 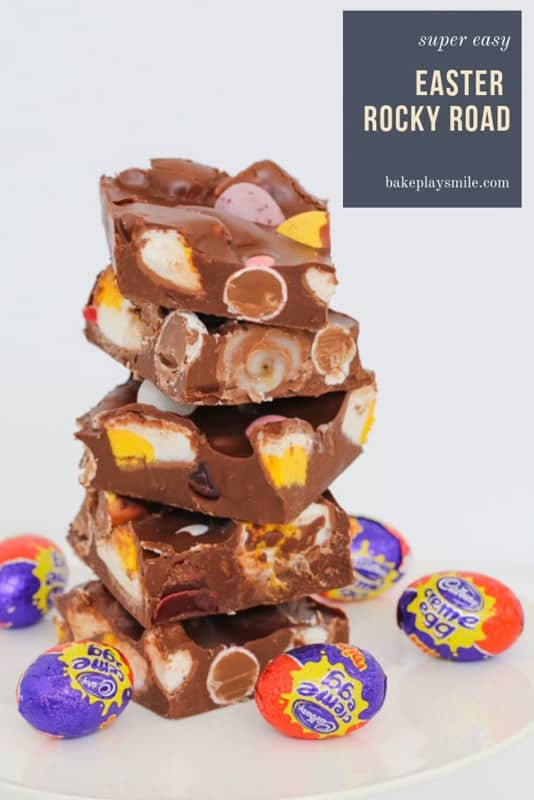 This recipe is SUCH a great way to use up any leftover Easter eggs you have lying around. And yes, absolutely, you can substitute any of the recommended Easter eggs for your own favourites. In this version I used crispy M&M speckled eggs, but you could easily replace these with normal M&Ms or anything you like! 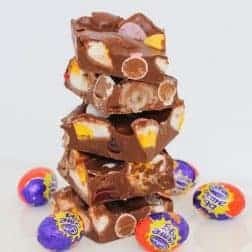 Same goes with the Cadbury creme eggs – if you’re not a fan, simply swap them for caramel filled eggs, Turkish Delight eggs or any other filled egg you like! 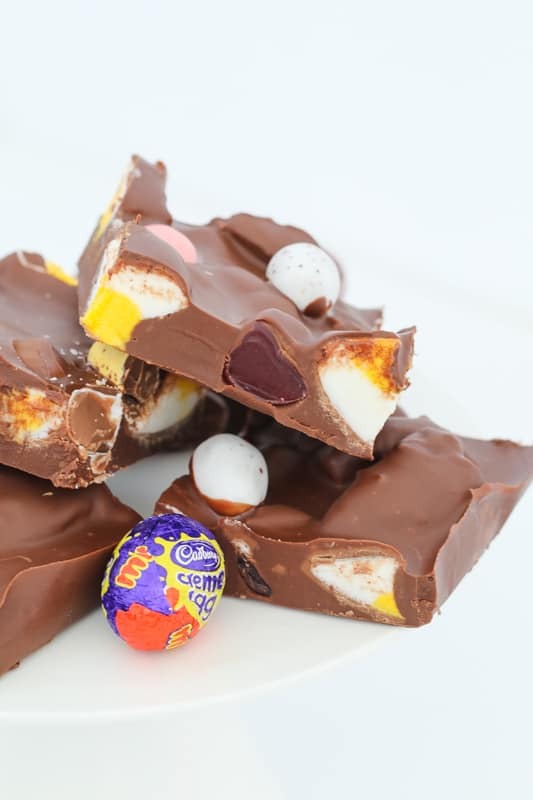 Just make sure you use mini eggs, as the larger ones will get all runny and gooey. *On that note, if you live somewhere hot, then you might want to pop your filled eggs into the fridge prior to making the rocky road. This will make sure they don’t melt when you mix them through the chocolate. I also used marshmallow Easter eggs, but if you want to save a little bit of money, plain marshmallows will work beautifully too. 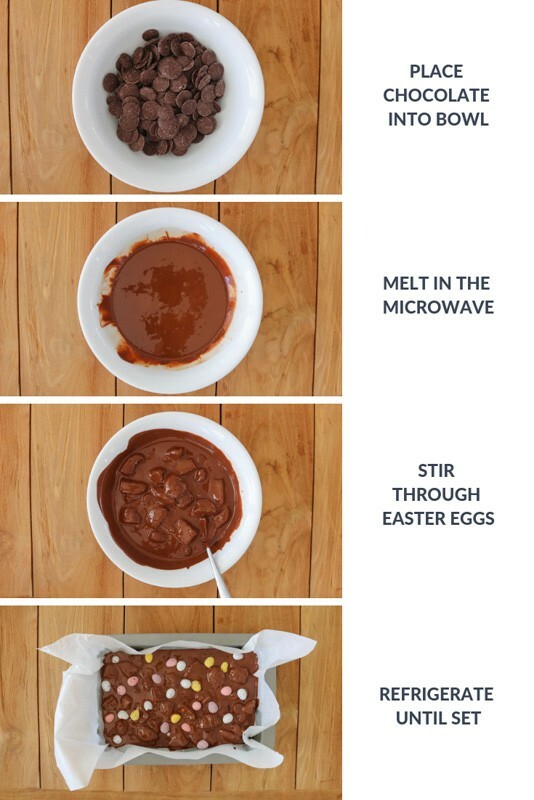 If you get to the day after Easter and realise that you’ve got 50 million Easter eggs still in your house… this is the recipe to make! 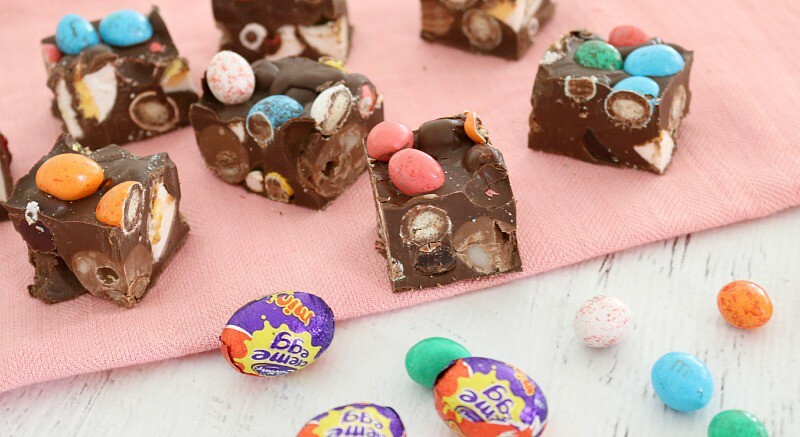 It’s the perfect way to use up leftover Easter eggs! The best thing about rocky road is that it lasts a long time! Simply place it into an airtight container in the fridge for up to 3 weeks. 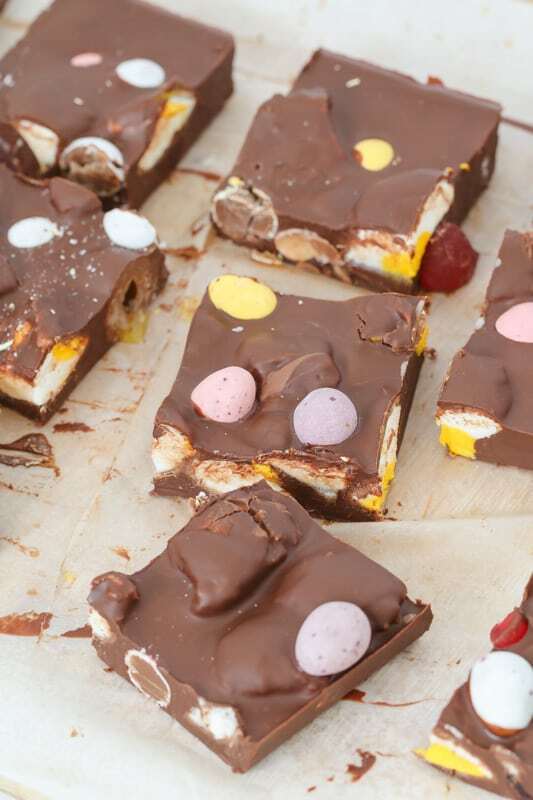 If you’re a little chocoholic like me, you are going to LOVE this rocky road.. I pinky promise!! Line the base and sides of a 16.5 X 26cm lamington pan with baking paper, letting the sides overhang. Chop the marshmallow eggs into quarters. Place the chocolate and coconut oil into a heatproof, microwave-safe bowl and heat, uncovered, on medium (50% power), stirring every 30 seconds with a metal spoon, for 3-4 minutes or until the chocolate and coconut oil has just melted (you can also use a double boiler on the stove). 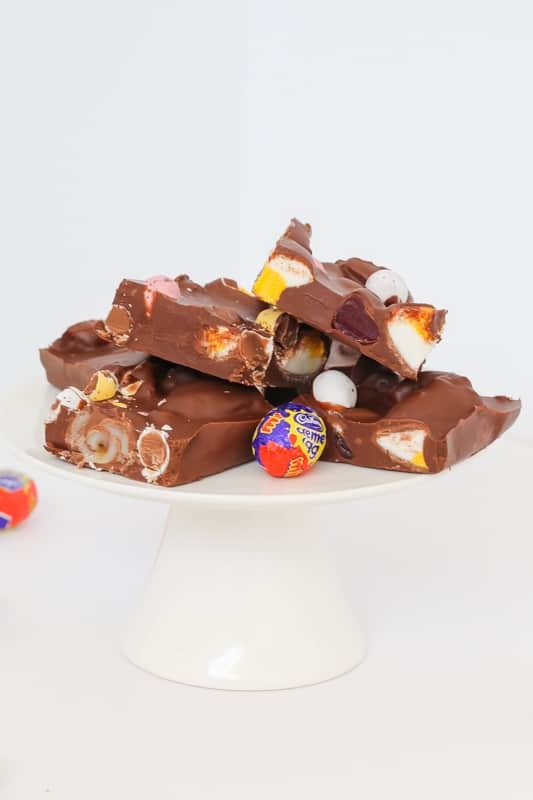 Stir through the crispy M&Ms speckled eggs, marshmallow eggs, mini Cadbury creme eggs and raspberry lollies. Working quickly, spread the mixture into the prepared lamington pan and sprinkle with the remaining crispy M&M speckled eggs. Place into the fridge for 2 hours or until completely set. Use a sharp knife to cut into slices. Place the chocolate and coconut oil into the Thermomix bowl and melt for 4 minutes, 50 degrees, Speed 2 (scraping down the sides occasionally). 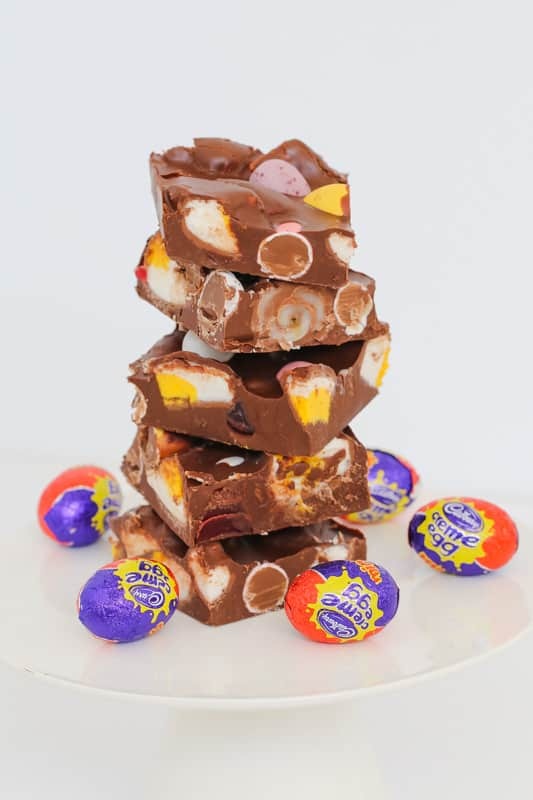 Add the crispy M&Ms speckled eggs, marshmallow eggs, mini Cadbury creme eggs and raspberry lollies and mix on Reverse, Speed 2, 5-10 seconds (using the spatula to help mix). This is egg-pic, it really is. I get a sugar high just looking at it! Best Rocky Road ever! Where did you get the marshmallow eggs from? This looks amazing, going to try it for family dinner over the weekend as we are on dessert duty! Thanks! Haha I’m sorry! At least everyone will love you!